After we left Punta Fuego, we agreed to have coffee in Tagaytay because we haven't had caffeine boost in the last 24 hours. We decided to drop by the famous Bag of Beans (main branch). I was so curious why this cafe is so famous. The dining area was almost full when we went down. The covered gazebos with the white curtains are offered for a fee, so if you want more privacy, you can take those. The ambience is good, if you love those garden-type restaurants. But be cautious because you would need lots of insect repellent here. It must have been the bushes and the other plants around. They also have a pavilion where you book your private functions. A wedding package here costs about P30,000 more or less. Their signage says "English Pies & Breads" but they also offer sumptuous breakfast and desserts. They also have a souvenir shop that sells organic skin care products. My friend Angela got the Dark Chocolate Body Scrub which smells like real cocoa. Since we went here for coffee, I ordered Mocha Frappe. When it was served, I got excited because it looks so yummy! Though when I tasted it, it lacks that "coffee kick'. It's sweet, that's it. So perhaps they can improve on that. The consistency is also not that impressive as it is not as creamy as I expected it to be. This is their Chocolate Chip Pancakes that my friend ordered. Three-stack, fluffy and true to its name, chocolatey! Their pancakes are not just plain pancakes garnished with whatever its named after. 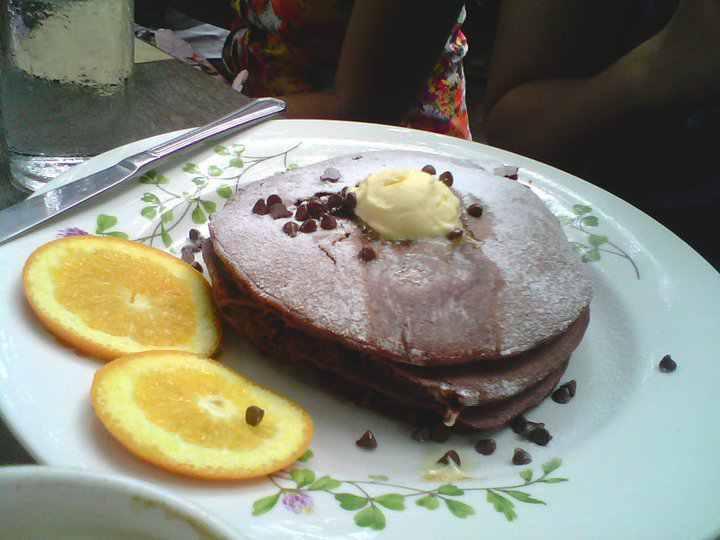 Instead, the pancake itself is mixed with chocolate chips, thus the brown color. See? 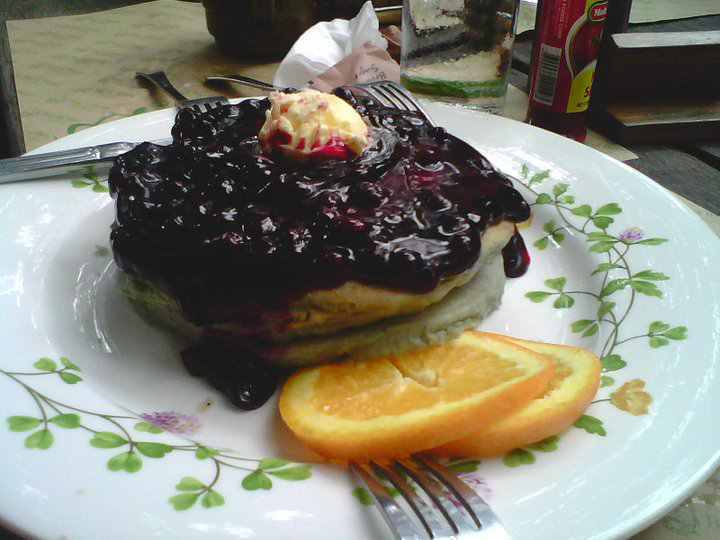 Even their blueberry pancakes are mixed with blueberries! Yum Yum Yum! This woke me up. And while I am writing this entry, I am craving for this heavenly goodie. Haven't had enough of blueberries? 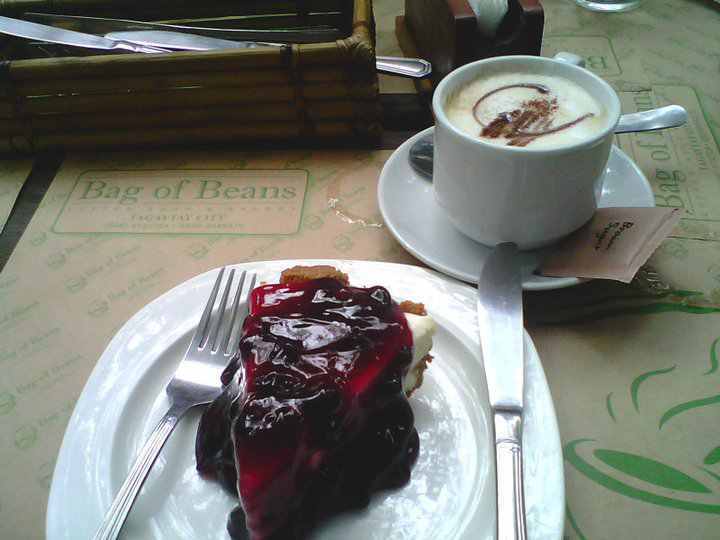 Then try their huge serving of Blueberry Cheesecake paired with their White Mocha coffee. Now I know why more and more people are addicted with the Bag of Beans. It may not be their coffee or hot chocolate, but their desserts will definitely kick you awake and make you come back.